Periodic weak ash emissions (15-20 m high) continued in March from cracks in the lava dome, although no dome growth was noted. Averages of five tectonic earthquakes, two volcanic earthquakes, and one earthquake associated with dome collapse, were recorded daily. Explosions began at 2200 on 28 December from a pre-existing crater [(Anak Ranakah)] in an area without known historical eruptive activity (figure 1). Figure 1. Geological sketch map (after Katili, 1988) showing the position of Anak Ranakah (labeled "new eruption center") in relation to other young domes and vents on the flanks of the Poco Leok caldera. From 28 December to 2 January numerous explosions sent columns 500-2,000 m above the vent. By 1 January, the vent diameter was ~ 100 m and ~ 40 cm of ashfall had accumulated near the rim. The ash was hot, but did not burn vegetation. Ballistic fragments of light-colored porphyritic dacite, up to 15 cm in diameter, were found in the ash deposits within several hundred meters of the crater rim. The rock fragments and ash were older hydrothermally altered volcanic rocks. Through 1 January there was no evidence for new magmatic material in the deposits. Larger explosions on 3 January (at 1611 and 1646) sent dark ash plumes to 4 and 6 km above the summit, dropping 1 mm of ash in Ruteng (8 km NW) and ~ 3 mm in Robo village (~ 4.5 km NNW). At 0322 on 4 January, a third large explosion occurred. As of 6 January, 20,000 people had been evacuated from an area within a 5 km radius of the vent. A VSI observer arrived in Ruteng on 30 December and was joined by two additional observers with a seismometer and radio on 1 January. Preliminary seismic data showed roughly 2-4 tectonic earthquakes and ~ 50 volcanic earthquakes/day. An observatory post has been established at Robo village, equipped with a short-period seismometer and a radio for direct communications with VSI headquarters. A second two-person team of VSI observers with an additional seismometer arrived 5 January. Local officials reported "fire" at the crater associated with the first explosion on 28 December, but no incandescence or lightning had accompanied subsequent larger explosions. A glow from the vent was first observed during the evening of 8 January. When VSI observers visited the crater on 11 January, they confirmed that a new plug of lava had risen 50-75 m within the crater. . . . Previous seismic activity includes a M 5.6 earthquake that struck the Ruteng area on 7 August 1982 at 0440, damaging the microwave station near the presently active crater and other buildings. Reference. Katili, J.A., 1988, Anak Ranaka: the birth of a volcano in Flores: Voice of Nature, n. 57, p. 6-11, 50-51. Numerous explosions from 28 December 1987 to 9 January 1988 sent ash columns to 500-6,000 m height. There was no evidence of new magmatic material in the deposits through 9 January but a glow above the crater was noticed that day. Two days later, lava was visible within the crater. The arrival of lava coincided with a change in signals recorded by portable seismographs: from A-and B-type earthquakes to rockfall avalanches on 9 January. Only rockfalls have been recorded since then. Between 10 and 14 January lava nearly filled the crater. Numerous large explosions, originally from rockfall avalanches off the new dome N into the steep-walled Wai Reno drainage, were reported on 12 and 13 January. The largest, at about 0530 on the 12th, produced a nuée ardente d'avalanche that traveled ~ 5 km N down the Wai Reno drainage. It knocked over and singed trees in an area of dense jungle as much as 1 km wide before stopping 700 m from the highway. After 14 January large avalanche explosions greatly diminished and lava began creeping into the Wai Reno drainage. From 14 to 21 January, most growth was in the flow rather than in the dome. On 22 January the flow was ~ 300-350 m long, 200 m wide, and 40 m thick, with a volume of 2.5-3.0 x 106 m3. Lava dome volume on 23 January was roughly 5 x 106 m3, and another 1.5 x 106 m3 of new lava was estimated to have fallen from the flow and dome as rockfall avalanches. At the end of January the lava dome was protruding ~100 m above the crater rim (~150-170 m above the floor of the crater). On 22 January at 0520 a large rockfall avalanche from the E margin of the dome moved ~ 0.5 km E into the valley between Ranakah and Mandasowu. It flattened dense jungle E of the dome and stripped and singed leaves at its perimeter. The avalanche was sufficiently mobile to follow a narrow NE drainage around a small hill (Bukit Timur) before sending a little material into the Wai Reno drainage. Rockfalls from the N lava lobe diminished after 23 January and most new lava continued to flow from the dome into the flat area to the E. Rates of lava extrusion averaged roughly 500,000 m3/day. As of 26 January, 4,200 inhabitants of the sparsely populated area N of Anak Ranakah had been evacuated to the city of Ruteng (population ~ 49,000). A VSI observation post has been established at Poka village, ~7 km NNW of the vent. Three radio-telemetered seismometers have been installed on the N side of the Wai Reno drainage. A VSI field party observed evidence for at least three former episodes of block and ash avalanching from prehistoric domes or flows into the Wai Reno drainage. In hand specimen, these lavas were characterized as plagioclase-andesite to dacite with differing proportions of hornblende, plagioclase, biotite, and pyroxene. The eruption continued through February. No explosions have been reported since 9 January, and seismicity since then has been limited to rockfall events from the growing lava extrusion. Photographs taken in late February indicate that the summit of the steep-sided lava dome was considerably higher than it had been during field work by VSI personnel a month earlier. Lava flows extending N and E from the dome had advanced further, and a new flow had emerged from the dome and moved S. Eruption rates appeared to slow during February to an average of roughly 200,000 m3/day. The eruption continued through March. When surveyed in late February, the volume of the lava dome was ~ 11.5 x 106 m3; the lava tongue descending the N side of the lava dome had a volume of ~ 4.8 x 106 m3. On 30 March at 0155, the crew of British Airways flight 11 (Singapore to Sydney) observed a large black cloud [over Indonesia] at 12.73°S, 119.30°E, roughly 450 km SSW of the volcano. The cloud was aligned N-S, well above the aircraft's 10 km flight level. A satellite image 25 minutes earlier showed a large convective cloud NE of the aircraft's position. However, a GMS image on 30 March at 0200, just after the aircraft observation, and others at 1100 on 29 and 30 March (NOAA 9 polar orbiter), showed heavy thunderstorm activity that can often both mimic eruption clouds and mask any that might be present. VSI observers reported that a large rockfall avalanche from the N side of the lava dome sent a glowing avalanche ~ 1.5 km down the Wai Reno valley on 30 March at 1930. A hornblende pyroxene plagioclase andesite sample collected in late January was analyzed by the USGS using X-ray fluorescence. Information Contacts: VSI; J. Latter, DSIR Geophysics, New Zealand [info from NZ Meteorological Service]; O. Karst, SAB. Lava production . . . continued in April. When geologists visited the volcano on 15 April, the summit of the lava dome had reached ~ 2,190 ± 10 m above sea level, an increase of ~50 m since late January. Lava extrusion has occurred primarily to the N, into the Wai Reno drainage. Very little growth of the lava dome has occurred to the W, E, or S. Rockfall avalanches from the growing dome occurred at the rate of ~90/day during April. The dome continued to grow during May, spawning ~ 50 rockfall avalanches/day . . . . Since the eruption began in December, lava dome height has increased 150 m, and the N lava flow volume has grown by 2.5-3.0 x 106 m3. The growth of the dome and flow slowed in June. Rockfall avalanches detected on the seismometer decreased . . . to an average of 40-50/day in June. In July, the lava dome and N flow continued to grow, but at slower rates than in previous months. Rockfalls detected on the seismometer decreased . . . to 30-50/day. Lava production had been gradually declining for several months and continued to decrease during August. Collapse of incandescent material was no longer visible, although collapse episodes were recorded seismically an average of six times daily, down from an average of 40-50/day in July. Tectonic earthquakes also averaged 6/day, but no volcanic seismicity was registered. 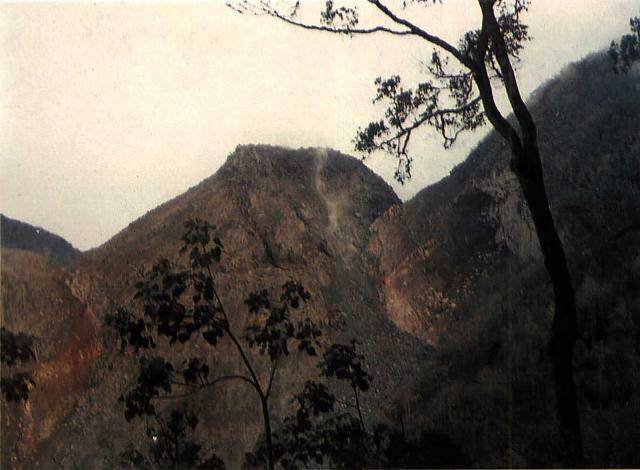 In November 1989, a white plume rose to 25 m above the solfatara field between the new Anak Ranakah dome and the older [Gunung] Ranakah. A seismograph recorded 121 distant and 15 local tectonic earthquakes, eight A-type and two B-type shocks, and 87 collapse events. A new lava dome, named Anak Ranakah (Child of Ranakah) was formed in 1987 in an area without previous historical eruptions at the base of the large older lava dome of Gunung Ranakah. An arcuate group of lava domes extending westward from Gunung Ranakah occurs on the outer flanks of the poorly known Poco Leok caldera on western Flores Island. Pocok Mandosawa lava dome, at 2350 m the highest point on the island of Flores, lies west of Anak Ranakah. There is no Deformation History data available for Ranakah. There is no Emissions History data available for Ranakah. A new lava dome, named Anak Ranakah (center) was formed in 1987 on the outer flanks of the poorly known Poco Leok caldera on western Flores Island. The new dome was located in an area without previous historical eruptions at the base of the large older lava dome of Gunung Ranakah. Anak Ranakah ("Child of Ranakah"), seen here from the SW, is part of an arcuate group of lava domes extending westward from Gunung Ranakah. There are no samples for Ranakah in the Smithsonian's NMNH Department of Mineral Sciences Rock and Ore collection. Large Eruptions of Ranakah Information about large Quaternary eruptions (VEI >= 4) is cataloged in the Large Magnitude Explosive Volcanic Eruptions (LaMEVE) database of the Volcano Global Risk Identification and Analysis Project (VOGRIPA).